Separate conductors provide plenty of room for experimentation and the plentiful conductor quantity keeps resistance low. Some cable theories hold that conductor material is the most important factor, while some lay the emphasis on geometry. It seems vdH swings the former way, for The Wind supplied as a single conductor, making geometry a variable in the hands of the end user. The company's advice is to twist the conductors together, but one could equally space them well apart over a small or large distance and, in doing so, will significantly alter the inductance and capacitance of the cable. Clearly those of experimental bent will want to try various options. The materials used are classic vdH - silver coated copper plus Linear Structured Carbon for the conductors with a 'Hulliflex' jacket. 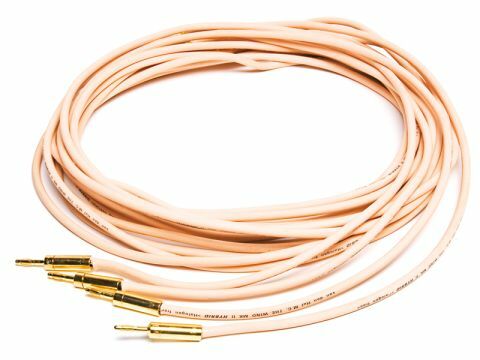 There's quite a lot of copper in there and resistance is usefully low, making this a suitable cable for ultra-low impedance speakers and/or long cable runs. For most of our listening we stuck with the twisted conductors option and found this for the most part satisfying. The sound is quite nicely balanced tonally and bass is powerful and energetic, but it seems to have a slightly coloured tonal quality which makes the bass seem rather darker than usual – not exactly veiled, but at any rate a touch less prominent especially when the low-frequency content is more melodic than rhythmic. Sudden bass impact can be quite impressive, though, really jumping out of the mix. Treble is a little dry and lacks some sense of space and this is where we felt there is room for manoeuvre by adjusting conductor spacing: tight twisting gives the most open treble, though still not quite on a par with the Atlas Hyper, for instance.